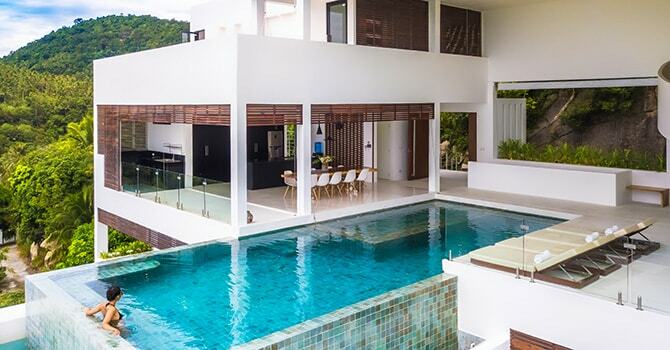 This 4 bedroom luxury island villa is a lush, modern escape with private pool, overlooking spectacular Chaweng, the tropical beaches & islands across the Gulf. 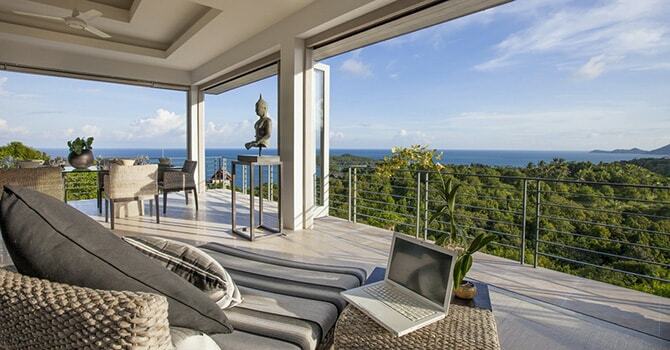 Luxury 4 Bedroom Sea View Villa Kohia sits among lush Koh Samui hills within easy reach of the stunning beaches of Thailand. Featuring a spectacular private infinity pool, this is a gorgeous and carefully designed luxury 6 bedroom villa in Chaweng just steps from the beach. 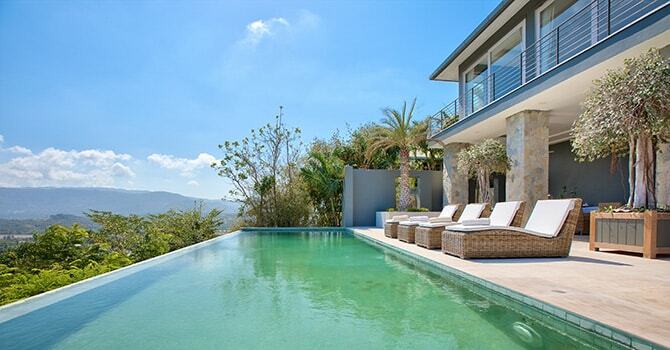 This luxury 4 bedroom Villa is a spectacular hillside ocean view Villa with a stunning infinity pool on lush grounds over Chaweng Noi and the sea beyond. A private Himalayan salt-purified infinity pool and heated jacuzzi are the central features of this magnificent 5 bedroom luxury villa in Chaweng Noi. Koh Samui is famous for its stunning tropical beaches and energetic nightlife - so it is no surprise that these two go hand-in-hand in Chaweng, the busiest area on the island. Here, within walking distance of the tropical beach is a long strip filled with famous bars and nightclubs of all different types and styles, yet there are still places to go to enjoy some peace and quiet here. Chaweng is on the east coast of Koh Samui, and, as stated, is the most popular resort town on the island. 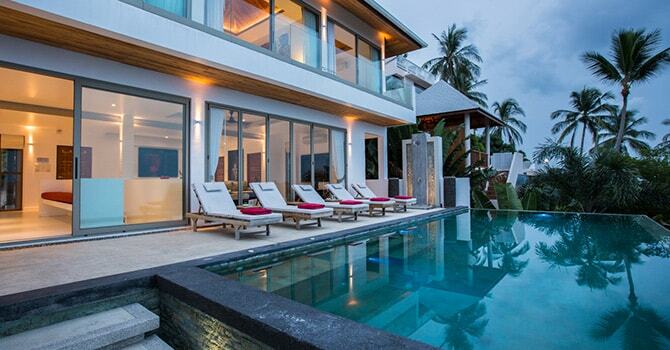 There are many choices for everything including luxurious villas in Chaweng Noi, on it’s southern end. You'll also find a great selection of bars, restaurants and shopping. The airport is located very close to Chaweng, so it is extremely convenient to reach your accommodation from your inbound flight. As the main commercial hub of Koh Samui, you'll have no difficulty finding transfers from the airport. Arriving in Chaweng Noi, the first thing that most visitors notice is the stunning beach & sea views. With a swathe of white sand that is an impressive six kilometres long, and beautiful blue waters flanked by tropical foliage, it is the ideal tropical retreat. As it is the busiest area in Koh Samui, many of the island's most popular activities are to be found here. Of course, the most popular of all is the beautiful beach - the ideal place for relaxing, perhaps on a sun lounge under an umbrella. While simply lazing on the sand is many visitors' activity of choice, you may also like to enjoy activities including snorkelling, windsurfing or jetskiing around the area. There is certainly no shortage of different activities to try out around Chaweng. Koh Samui is also known as a diver's paradise, with many divers basing themselves here before heading out on full-day excursions with one of the many quality dive trip operators. Aside from the beautiful beach, there are also many other fun activities for visitors of all ages to enjoy. Aquapark Samui is always a hit with families, offering many different fun water activities for the young and the young-at-heart. There's also the creative 'football golf' which is another fun activity for youngsters. For those looking to soak up some Thai culture, it can be found around Chaweng. Many tours are on offer, with one popular place to visit being Wat Khao Hua Jook, a quiet but beautiful temple atop a hill, that offers beautiful views out around the surrounding area. 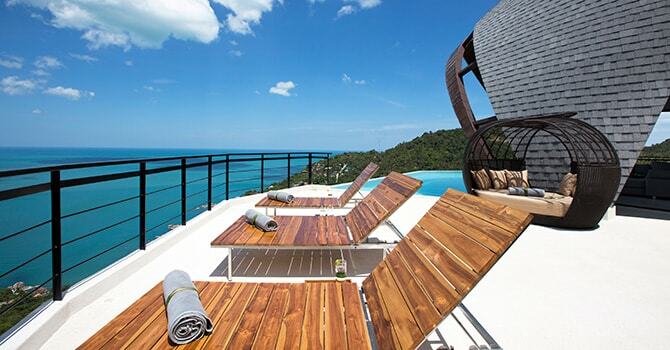 On a clear day, you can see no less than five other Thai islands from the beautiful vantage point. Another thing that draws many visitors to Koh Samui and Chaweng is the promise of amazing Thai food - and you certainly won't be disappointed. From the street food at the Chaweng Night Market to the romantic Tree Tops restaurant, there is so much to enjoy in the area. If you want to learn how to prepare delicious Thai food in your own home, then taking a Thai cooking class is a brilliant addition to your itinerary. Once the sun goes down, Chaweng turns it up a notch and becomes the party central. There are so many options for dancing the night away while enjoying a cool beer or delicious tropical cocktail along with the tunes of some top local and international DJs. While Chaweng has many low-budget beer bars, there are also a number of stylish and elegant beach clubs to enjoy as well. If you need to rejuvenate after a late night enjoying the bars and restaurants of Chaweng, you're in luck! There are many fabulous spas and massage parlours where you can indulge in luxurious treatments including massages, facials, manicures and more. These can also be provided in the comfort of your own villa, if preferred. If you'd like a souvenir to remind you of your time here, there is plenty of choice. The area is home to many different shopping complexes, including the massive Central Festival Samui which sells all different things within its 90,000m of retail space. There are also numerous markets where you can pick up trinkets, souvenirs and crafts of varying quality - half the fun is bartering your way around and finding some hidden treasures to take back home with you. With such a beautiful beach, bustling nightlife and an amazing selection of activities for the whole family to enjoy, it is no wonder that Chaweng is a popular resort town. While there is no shortage of resorts on offer, many visitors instead prefer to take advantage of the convenience offered by the modern Chaweng Noi villas instead. If you want to visit, we suggest getting started planning your trip early so as to have the ideal holiday in this beautiful and exciting destination, as it does get very busy in the high season.